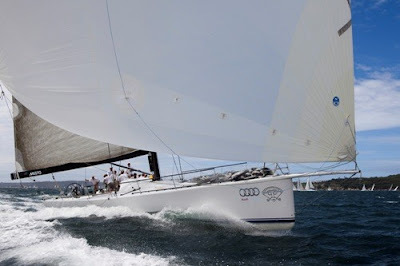 Day two of Audi Sydney Harbour Regatta produced some thrilling spinnaker rides as the big boats screamed back into Sydney Harbour on a short, sharp sea and on the back of an east nor’east breeze that was gusting up to 25 knots, throwing up bow waves and plenty of spray over the deck. Wild Oats X’s bad luck yesterday due to generator trouble that forced the Reichel Pugh 66 to retire from the first of the two offshore passage race series looked to have turned around with a close line honours win today. But post-race, skipper Mark Richards admitted they had virtually limped around the course with more mechanical issues and two ripped kites that saw them finish goose-winging the sails in the absence of a spinnaker. After a gnarly kite run to the finish just short of the Opera House, yesterday’s line and overall winner Loki, owned by Stephen Ainsworth and skippered by the super cool international yachtsman Gordon Maguire, is looking famous for another top placing on corrected time. Maguire, at the helm of the Reichel Pugh 63, made the 18-20 knot turbo-charged ride to the finish line in amongst the many other divisions racing around the Harbour look like a walk in the park.